Until recently, there was one big hole in my personal Final Fantasy history – the one game from the entries before the series went online that I hadn’t beaten. Final Fantasy VIII was the successor to VII that I knew didn’t live up to the magic of VII at all. I knew about how Squall was a lame protagonist in comparison to Cloud, about the stupid-as-hell “plot twist,” I’d heard of the “Rinoa = Ultimecia” theory. I’d even started the game several years ago, and played the first 2 hours or so, but then gave up, deciding to invest my time into something I’d like more. Now, with the ability to play it on the PSP, I finally went back to this game and filled that gap. 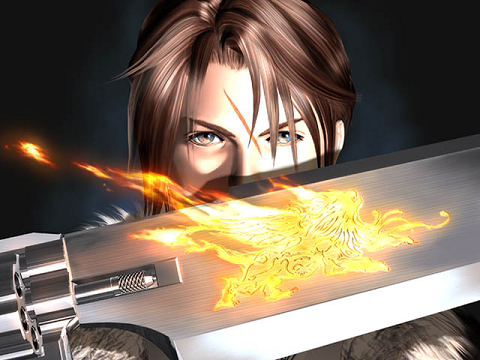 I should say that Final Fantasy VIII entirely lived up to the expectations – nowhere near VII’s league, but nothing incredibly horrendous like its biggest haters would claim. The story and characters are pretty uninspired as a whole (except from a couple of exceptions I’ll mention later), but it makes some interesting gameplay experiments, which ultimately make it easily abusable, but I wouldn’t write them off as bad. 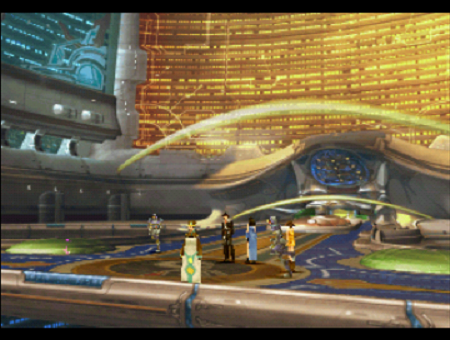 It also offers some interesting locations, as most FF games do, and a relatively epic final stretch. After a promising beginning, there are some incredibly ridiculous moments in the story later on, which harm the game’s overall quality big time. Could Final Fantasy VIII truly have outdone its predecessor? Extremely unlikely, yet Square tried to. And that was already a recipe for disaster. Instead of changing the setting entirely (like they later did with Final Fantasy IX), they pushed for another game in a fictional contemporary/futuristic setting, so comparisons were inevitably going to be made. I fail to understand what they were really banking on, as Final Fantasy VIII failed to compete with its predecessor on all fronts. Most of all, the story one. In comparison to VII’s deep psychological and environmental themes, VIII’s story seems incredibly juvenile, lacking any true depth. You are a soldier trainee in a military high school-like facility, and your aim is to fight the evil sorceress who wants to control the world. That’s it, and it doesn’t get much better through the course of the game (in many ways, after the first disc, it gets worse). After a very fascinating first true mission in Timber, after which the game had me pumped and ready to lose all my pessimism, the story quickly took a nosedive, featuring some incredibly unlikely situations, the stupidest plot twist you’ve ever heard of (it really IS that bad), some more head-scratching moments, and an admittedly cool finish, but not nearly cool enough to salvage the mess up to that point. Truth be told, a main focus of the game is the love story, which is by far the strongest driving force for Squall near the end, and it’s not such a bad love story in itself, but it would’ve helped tremendously if the situations around that love story weren’t so badly written. Very little about the Final Fantasy VIII cast is memorable, with a few big exceptions. 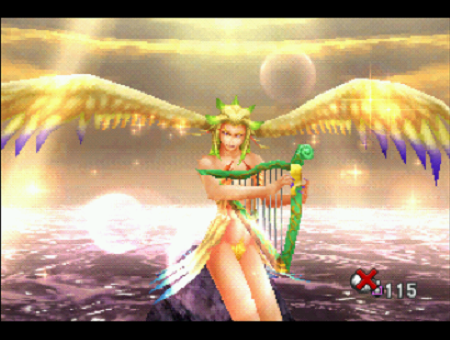 If you’ve read my Top 10 Final Fantasy Girls list, you’ve noticed I listed 2 girls from this game to it, which is no small feat. 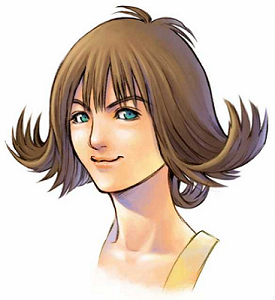 Selphie is a really fresh character, her optimism and belief in the party’s abilities make a nice contrast with Squall’s constant state of worriedness. Her train song is easily one of the highlights of the game, and a major factor why I like her so much. Her blog on the Garden’s intranet is also quite interesting to read. Selphie gets one chance to lead the party and does a formidable job, and her connection with Trabia is touching. Rinoa, the other girl who made the list, is Squall’s love interest, and the source of the one truly awesome point in the game, the Timber mission early on. Her patience with Squall and her insistence to slowly crack his shell are truly admirable. But, while an interesting character and one of the better ones in her game, she doesn’t really stand out as a great game character, period. But let’s talk about the main protagonist, Squall… When the party “leader”‘s favourite phrase is “…Whatever.”, you know he’s not a very good leader. Nevertheless, the plot just pushes Squall into those big shoes, and he reluctantly accepts it, actually making an effort to fit into them. Again, Rinoa’s influence there is big, as his love for her drives him to make several important decisions. An asocial teenage kid would probably strongly associate with Squall, because that’s exactly what he is… And that must be where his popularity stems from. But, to me, he has very few redeeming qualities as a character. Even though the reason for him being that way is explained in the game, I still don’t find it a good enough excuse. Just weakness. Even the fact that you get the chance to read his thoughts quite often through the game doesn’t help much. Other party members are quite bland with one or two good moments. Quistis starts relatively interesting and then just falls off the map. Seifer, Squall’s rival through the course of the game, is also pretty bland and really annoying at times. His two “sidekicks,” Fujin and Raijin, though, make an interesting duo that has a nice dynamic with the party. The villain, the evil sorceress, is pretty lame, and reminds of the early JRPG days when the story was completely one-dimensional, so villains were just some ultimate evil you had to overcome. One awesome character I must mention, however, is Laguna. He’s easily my favourite in the game, along with Selphie. A goofy average soldier in the beginning, his big heart makes it easy for him to gain friends and win people’s trust. He’s just so natural and kind in his interactions with others, it’s like he’s from another game entirely. It’s no wonder Selphie has a whole section on her blog dedicated to, as she kindly names him, “Sir Laguna”. The almost brother-like relationship between him and his close war buddies Kiros and Ward is one of the heart-warming things about Final Fantasy VIII. 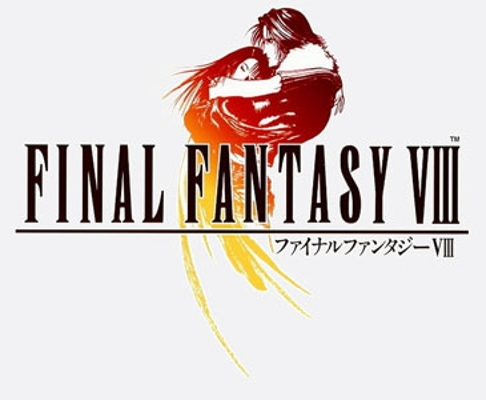 Final Fantasy VIII is mostly similar to previous games in the series in terms of gameplay – the world has a number of towns you can visit, you can move around the world map, there are dungeons, random battles await every once in a while, the battle system uses the ATB gauge, the speed of which is determined by the Speed stat of your characters. You can buy items from shops or obtain them after winning battles… And that’s about where the similarities end, and the differences begin. The main thing that stands out about FFVIII’s gameplay is the Junction system. 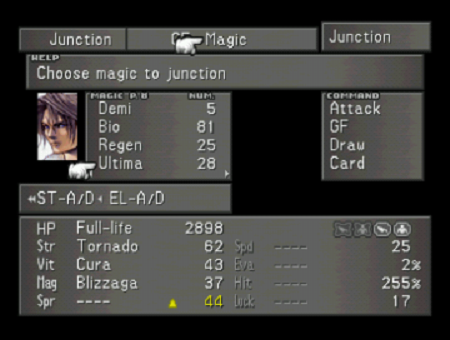 Each character can junction GFs (FFVIII’s version of summon monsters) and magic. GFs give the character access to various abilities (including simple things like using magic or items – only the “Attack” command is available in the battle menu if you haven’t junctioned anything), while junctioned magic improves his/her stats. And yeah, magic does not depend on MP, in fact, there is no MP stat at all in this game. Magic is quantifiable – for instance, you possess 5 Fires, which means you can cast 5 and not a single Fire spell more. You can obtain magic by finding it on various location, or drawing it from enemies. Some relatively weak enemies can offer quite useful magic, so you’ll inevitably occasionally find yourself in long battles, drawing all the magic you can instead of dispatching the monsters. The process of junctioning all the right spells to the right stats is slow, but not as bad as, say, Chrono Cross element allocation. GFs have HP of their own, and, while your summon is loading, are acting as a temporary shield from attacks (until their HP runs out, of course). Some GFs offer powerful attacks, and you’ll probably find yourself using them often in battle, instead of wasting your limited magic that’s much better used junctioned to vital stats. Most GFs are not in plain sight, and you’ll probably not be able to find them all on your first playthrough. GFs can also level up just like characters, and learn abilities. You can choose which ability the GF should learn next, among a list of available ones. You can also buy items to teach them new abilities. One neat thing about GF attacks is that most of them can be “boosted” by the player (if you learn the respective ability). 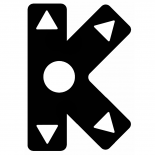 Boosting consists of simply pressing the Square button many times to make the attack stronger – and avoiding pressing it while an X mark is shown, because you go back to the initial value if you do that. The biggest plus of boosting is, you guessed it, keeping your attention during long and otherwise annoying summon animations. Another interesting thing is the practical lack of equipment. Characters only have their weapon and that’s it. No armour – the junctioned magic should probably serve as armour. Weapons can be upgraded if you have the required materials, but, without going out of my way, I could only upgrade a couple weapons to the second version. Aside from that, items are pretty much standard FF fare. But GFs offer the ability to refine magic or other items from items (as well as stronger magic from weaker magic), which may make that useless pile of junk you’ve accumulated until the end-game worth something at the end. 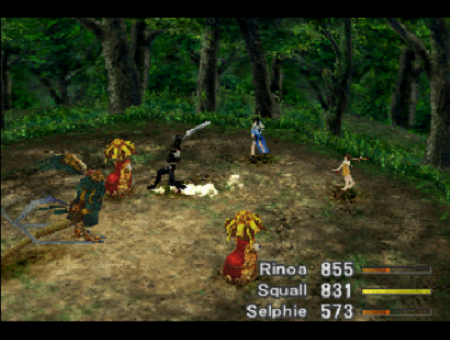 Battling in Final Fantasy VIII is interesting in the fact that enemies level up with you. Thus, no matter how low or high your level, the enemy will always be at least somewhat challenging (well, tougher enemies, at least). Still, until the last few hours of the game, there aren’t any very difficult battles if you know what you’re doing. Even bosses rarely pose a threat. Once you get near the end, though, the going gets tough, and there are some boss battles that’ll require all the right junctioning and tactics to win. If your HP is low (or if you cast a certain spell), your characters get access to their unique Limit Breaks, which can be very useful, but are generally a notch below the powerhouses that Final Fantasy VII limits could be. 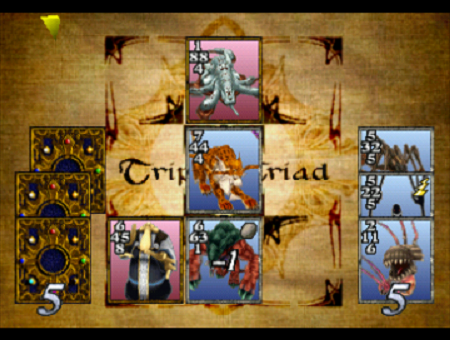 There’s a pretty significant mini-game in Final Fantasy VIII, a card game called Triple Triad. By talking to people with the Square button, you’ll often get the chance to play cards with them. The winner gets one or more of the loser’s cards, depending on the game rules in place. You can also obtain cards from actual battles in the game. I won’t get into further details about Triple Triad, I’ll just say that I have clocked a few hours playing it, and I’ve reset several times after losing. Speaking of hours, the game will take you 50-60, unless you rush through it. Feels like too much time for such an uncomplicated story, but I have to say the progression and pace aren’t too bad. The final dungeon takes much longer than it should have, it’s a clear example of artificially lengthening a game, but it’s not much of a big deal. I have to say that I felt the Final Fantasy VIII world was really small, with few locations to visit, and even fewer of them notable, until I got to Esthar. But, even with Esthar in mind, the world feels kinda small. Still, Final Fantasy has rarely been about huge worlds. Compared to the blocky models its predecessor used (even the FMVs in Final Fantasy VII looked far from realistic), Final Fantasy VIII is a big improvement in the realism area. The FMVs are quite beautiful, starting already with the opening movie. 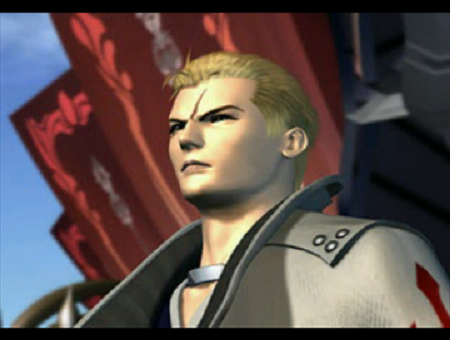 Squall and the rest look quite human-like, not just due to the complexity of the models, but even in motion. Of course, the game itself does not offer such detail as the FMVs, but, if one could say VII was the first 3D Final Fantasy that couldn’t quite let go of the tried and true 2D approach, VIII was a firm step into the 3D realm. Aside from FMVs, though, and especially in terms of environmental design, there is much to be desired. 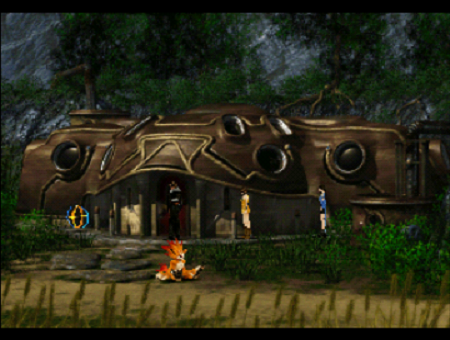 Final Fantasy VIII offers some interesting areas, but none of them really make you go “Wow!” While they are generally creative, the way they are drawn just doesn’t quite match that. Even Esthar becomes rather boring a minute after the initial awe. The characters have relatively interesting designs, overall – shame that most of them don’t have the personalities to match. One thing to note is that you occasionally get to change clothes and see the characters in different outfits – something rare in previous Final Fantasies. GFs are truly massive monsters of overwhelming scale – sometimes, you wonder how come the damage they do isn’t proportional to just how big they are and how devastating their attacks look. I already mentioned that the world seems kinda small – probably because most locations look more or less the same, due to their similar technological level, with a few notable exceptions like the Shumi village and Esthar. Final Fantasy VIII’s soundtrack is one of the best things about the game. It doesn’t match the amazing soundtracks of the previous two games, but there are quite a few catchy tunes worthy of being added to your music playlist. Nobuo Uematsu once again proves he’s among the best. A few themes I’d like to highlight are “Find Your Way”, the boss battle theme (a good boss battle theme always gets you so pumped for the difficult battle), “The Stage is Set” and “The Spy”. But my favourite is the theme playing during Laguna’s party’s battles, called “The Man with the Machine Gun”. It’s the one I’m sharing with you as part of the review. 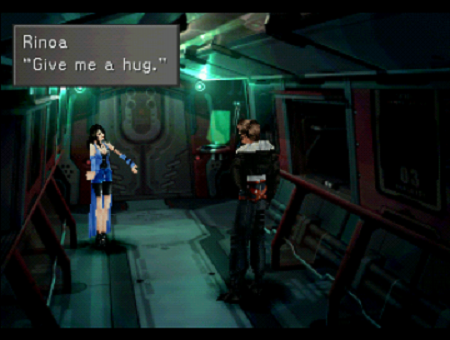 Final Fantasy VIII has its moments, but they are few and far between. As a whole, the game is mostly a failed half-experiment. Clearly, they wanted to follow in VII’s footsteps with the setting, while introducing some new elements and emphasising on the love story between Squall and Rinoa. Unfortunately, the world turned out much blander, the experiment with GFs and Junction has questionable merit at best, and the love story isn’t particularly great, not to mention the rest of the game’s story being a mess. Most of the characters are also uninspired, as are the villains, with Selphie and Laguna being the only awesome ones and the exceptions that save the game from being a complete disaster. Battles can be fun, as can the card game, but those are still relatively rare moments in the grand picture. Square just couldn’t make up their mind whether they wanted to simply create something to capitalise on VII’s glory, or something completely new. VIII’s story is likely to appeal to a younger audience in comparison to its predecessor, and there’s only a passing shadow (if that) of the deep subjects explored in detail in VII. The depth is on the level of your average Final Fantasy (think IV and V – certainly not VI or VII), and there’s little else to compensate. Out of the five “golden age” mainline entries (VI-X), VIII is by far the weakest. For what it’s worth, it’s a tad better than the recent XIII. FFVIII is still a recommended play for big fans of the series, as they should know Final Fantasy’s ups and downs. But the general RPG fan can safely pass on this one knowing he’s not missing much. In the fact that you really only battle to unlock Encounter None, then you don’t battle anymore. Because enemies level-scale with the party, you don’t gain a competitive advantage from leveling and have no incentive to fight. Then instead of actually casting magic, you junction it to stats like strength, but most notably HP to increase your maximum. You can be at a normal amount of HP, but since your maximum is so high, you’re at a low percentage, so every time you switch back to that character you have a chance at getting a limit break. Combat becomes Renzokuken ad infinitium. I know jRPG’s aren’t exactly paragons of involving combat systems but FF8 is somethin’ else. Flaws in the game are definitely the story (stupid-as-hell is a fairly good description of the plot twist) as well as the combat system, which requires you to draw, draw and draw spells like a mofo during battle, making combat *incredibly* tedious and long-winded in the process. However, positives are the music (some of Uematsu’s best work is to be found here, for now ignoring songs like Eyes On Me and its numerous variations, which are INCREDIBLY cheesy) as well as the artwork: in my opinion, some of the location backgrounds are very detailed and lovingly designed and I’d go as far as saying that FF8 has some of the best art work I have ever seen in a video game. (That said, I do agree inasmuch that FF8 does lack the “Wow!”-factor one tends to encounter in other FF instalments – like crossing the bridge to Remiem Temple in FFX, for instance). Things is, I’m biased. I have so many positive memories connected to this game (first days at university, etc) that it’s hard for me not to regard it as an all-time favourite in spite of all its obvious weaknesses and flaws. It’s like listening to an album you know isn’t all that great but can’t help loving all the same because of the time you went through as you were listening to it (which probably explains why I still enjoy listening to Hole or Candlebox every now and then). If I was new to the game I’d probably share your opinion 100%, but as we know nostalgia always makes it impossible to have an objective opinion.